Yesterday, I finally bought Flushed Away out of the $5 bin at Wal-Mart after holding off for years to replace my pan-and-scan copy with a widescreen copy. I'm aware that Paramount/DreamWorks have been releasing older DWA films with very generic packaging that I'm not a fan of and removing the disc art for the generic gray disc label and it seems Flushed Away did not get that treatment. When I opened the DVD at home, I was disappointed to see Paramount's usual gray label on the disc. 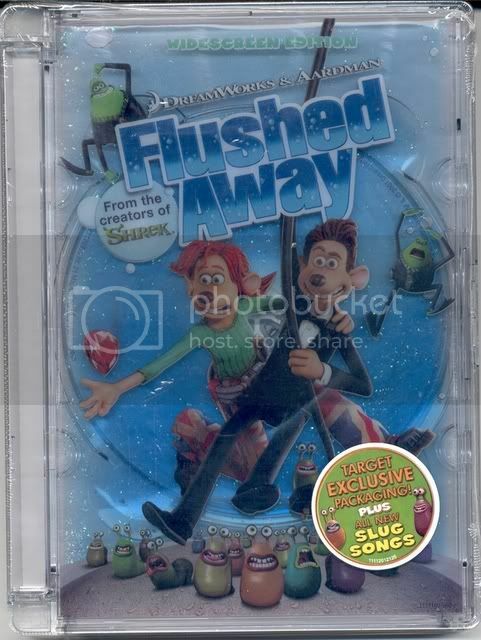 This has got me wondering, as Flushed Away did come out on DVD in 2007, did it ever have actual artwork on the disc during it's five years on DVD? And to further my point, when exactly did Paramount begin using gray DVD labels in lieu of actual disc art? It's not that it's a big deal or anything, it's just more that I would prefer to just track down versions with disc art of certain movies if I could. Are most studios doing the Grey Label thing on (... standard) DVD releases? Or just Paramount and Disney? I know for a fact the grey Disney labels are not a worldwide, the ones here in Australia are full colour and gorgeous. As for grey Paramount releases, I'm pretty sure they've been happening for quite a while. Five years wouldn't surprise me. I have a brand-new first edition of "Flushed Away" and it has a Grey label. So I guess that answers that part of the question. The Target exclusive of Flushed Away has disc art.